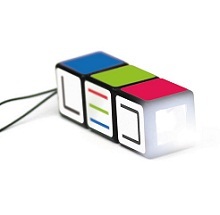 Our new Rubiks Torches are great promotional business gifts with a cool feature - a twist action 3 rotational feature to activate the super bright L.E.D bulb - with a 70 hour continuous battery life for those long exposures to brand awareness. Line-up the branding to activate the torch! Personalise with your Company's logo branding and rest assured your gaining good brand name retention and awareness, aswell as providing a fitting, useful and innovative Company gift to virtually any customer that is sure to be used for years to come. Packed in a neat aluminium tin! For a FREE QUOTE, please fill in the form regarding our Rubiks Torches and we'll be able to help you.